Too cold to get a shot of Fire Station #6 on a February Syracuse day, but fire departments in every community in the country take a certain amount of pride in their flags (see Chicago Fire Department flags to the right). Okay! 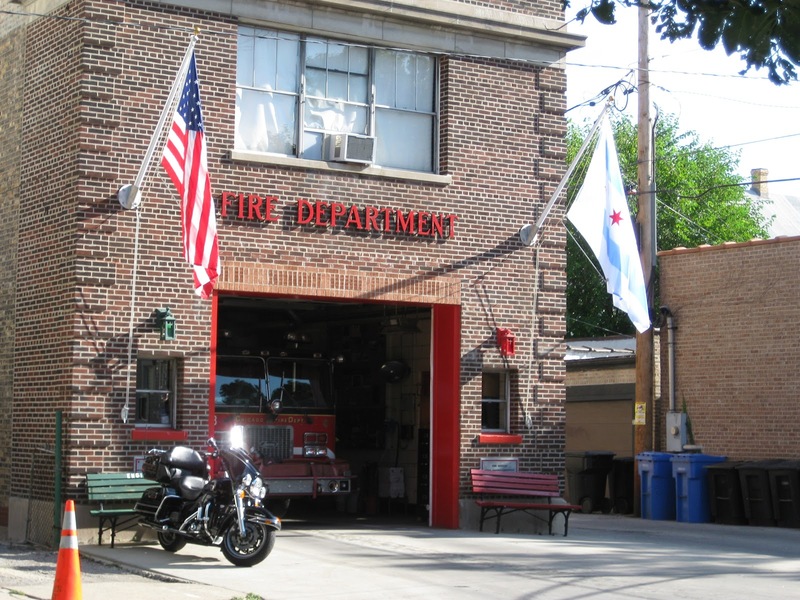 Access to a ladder truck means the ability to fix any flagpole problem at any time. If you have a flagpole older than 5 years, chance are you have experienced problems which require part replacement or you are about to. 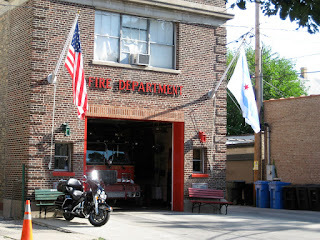 Even the local Fire Departments may not be aware of their own flagpole system. In today's case, we'd like to discuss flagpole trucks. A flagpole truck is a device that sits at the top of the flagpole and has a pulley mechanism for halyard or rope to smoothly pass through. There are single sheath and double sheath trucks. This basically means one-pulley or two-pulley. If you have a two-pulley truck, you may think, "roep is up on one side, why bother with the other side?" Most double truck systems we find in the field have rope only on one side. Back-up. We never want it to happen, but things happen. Storms come through, the rope is left as the last line of defense for a flagpole. If you have two halyards up, one can fail and you still have a second back-up to keep the flag flying. Integrity. We don't mean your dignity will be bruised when the flag comes down. We actually mean the structural integrity of the truck itself. All these parts work to manage stress. The truck takes all the stress. The ropes help relieve the stress. To have rope on both sides, the truck is then balanced and prevents all sorts of problems caused by one-sided system. Local Fire Departments will sometimes work with the community to help them fly the flag. If you have a flagpole that needs work, you might find the fire department willing to come out and help fix your company's flagpole. Happy flying!